It’s been a hectic month with the launch of Growing Talent 6 and the planning for Growing Talent 7 almost simultaneously – still keeps me out of trouble. Growing Talent 6 is going well with the remaining eight Associates. 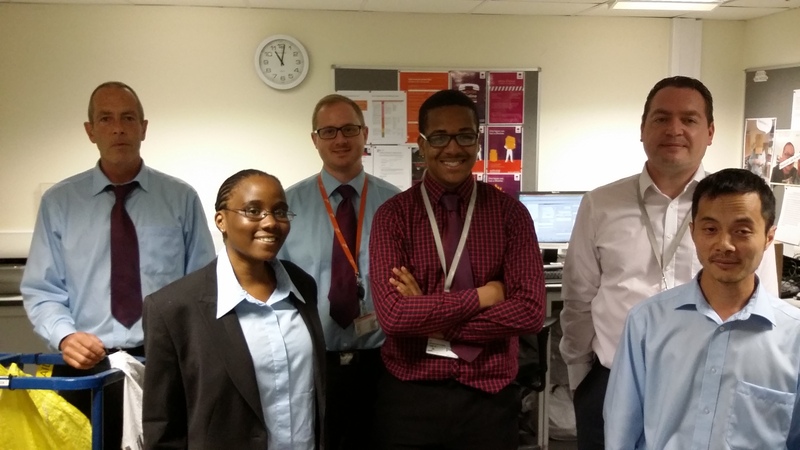 This week I’ve been to see Joshua working with the Mitie TDM’s mail and distribution team based at Hays Galleria…. Wearing a stand out stripped shirt, Joshua is doing well, supported by his team – Jeff, Lys, Rob, Joshua, Jerry and Simon. 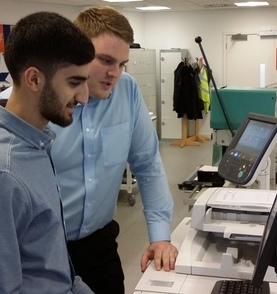 Also part of the Mitie supergroup is Mehmet based in More London with the print team. See below with Jordan……………..
All eight are focussed on the end goal – that regular salary! On top of this I learnt about Growing Talent’s shortlisting for Personnel Today awards and my nomination for HR business Partner award – what a month. What will August bring??????? Previous Yay………. Growing Talent is shortlisted!!!!! Next You can almost touch the talent!